Do you want to become a teacher, but don't have money for further studies? There is good news for you. 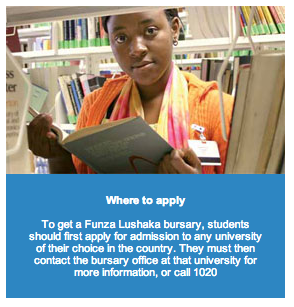 If you are committed to facing the challenges of a teaching career, Funza Lushaka is ready to offer you a bursary. There is a shortage of skilled teachers in South Africa. This makes teaching a priority study field. To encourage young people to become teachers, Government will give students full-cost bursaries to study teaching. 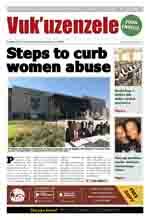 In the past bursaries covering up to 80 percent of the costs were made available. A full-cost bursary covers almost all of a student's financial needs. This includes registration and class fees, accommodation with meals, books and learning materials, as well as monthly living expenses. In some cases, travel expenses will also be covered by the bursary. be willing to teach in any school to which they are appointed by their provincial education department. Learners who are now in Grade 12 and who want to study teaching will be considered for the bursary. Students who did not complete their teaching studies, but still want to finish, may apply. People in other jobs who want to change their careers to teaching, or unemployed people who want to become teachers, are also encouraged to apply. Foundation Phase specialisation - Grade R to 3. Intermediate Phase - Grade 4 to 6 African Languages, English, Mathematics, Natural Sciences and Technology. Senior Phase - Grade 7 to 9 African Languages, English, Maths, Natural Sciences, Technology. FET - Grade 10 to 12 African Languages, Agricultural Sciences, Agricultural Technology, Civil Technology, Computer Applications Technology, Electrical Technology, Engineering Graphics and Design, English Language, Information Technology, Life Sciences, Mathematics, Mathematical Literacy, Mechanics and Physical Sciences.